Designed by Alan Folts of Greenville, N.C., the Folts Minimalist neck knife produced by Columbia River Knife and Tool friction-fits in an inverted sheath worn around the neck. Grasp the deep finger grooves of the handle or the braided nylon fob hanging from it and pull the knife free for quick one-handed deployment. The unusual handle style, made long and thin and offset from the blade, works well when the handle tucks behind the middle joints of your fingers. For a heavy shearing cut with the spine of the handle set against the palm, there's just not enough handle here to get a secure grip. Use the Minimalist improperly, and there's a good chance the handle will twist in your hand. The Wharncliffe blade, only 2 inches of straight-edged, talon-shaped 5Cr15MoV stainless steel, provides considerable strength in spite of the knife's light weight of 1.1 ounces. Ground with a rugged flat taper and built with a full tang micarta-slab handle, this knife doesn't have the cheap feel of other neck knives made from thinner stock. Used for slicing cuts as intended, it's a sensible blade. Although the concept of a neck knife is an intriguing idea, in actual use you may find them inconvenient. If they'd stay where you put them, it would be a lot better than what they really do, which is bounce and jangle about and never stop in the same place twice. Secure enough in demonstrations, the friction fit sheaths aren't foolproof when moving fast or weaving your way through heavy underbrush. It's very possible to lose a neck knife without even noticing. As an emergency blade or a backup knife, the Minimalist makes better sense strapped to gear or sewn to the inside of a hunting vest. 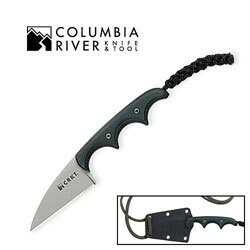 At 1.6 ounces including the Zytel sheath and nylon neck cord, it's a dependable but light-duty knife that outdoorsmen won't notice until it's needed.